At the height of clothes rationing during World War II, U.K. civilians were introduced to Mrs. Sew-and-Sew, a fictional character cooked up by the British Board of Trade to promote the art of “make do and mend” in a non-confrontational but no less creepy way. 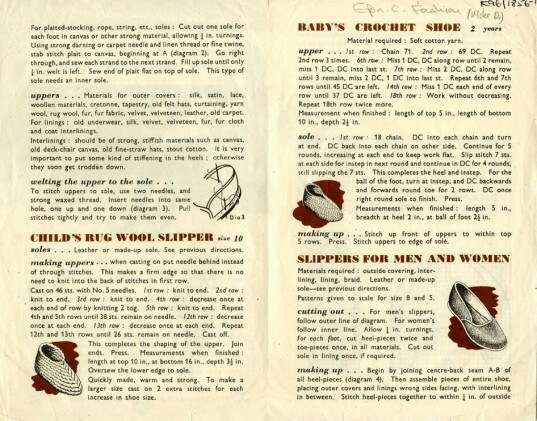 Through a series of instructional leaflets, the glassy-eyed homemaker doled out advice on how to stretch out meagre supplies of cloth and other raw materials that were increasingly routed for military production. One of them was saving wear and tear on outdoor shoes by swapping them for slippers inside the house. “You’ll probably have enough materials for them among the pieces in your scrap bag,” she chirps, suggesting old carpet, rug wool, and even braided stockings as soles. Want to make your own? A facsimile of the flier, plus instructions, after the jump. Materials: leather, cardboard, canvas rope, string, rug wool, old carpet, macrame twine, old stockings cut into strips and plaited. Getting the size:Making up: fabric or leather soles—if using woolen material, cut each sole four times. But don’t forget, the thicker and stronger the sole, the longer it will wear. Stitch pieces together across and across until quilted all over. Leave ¼ inch all around for welt on which to sew the uppers. For plaited-stocking, rope, string, etc. soles: cut out one sole for each foot in canvas or other strong material, allowing ¼ inch turnings. Using strong darning or carpet needle and linen thread or fine twine, stab-stitch plait to canvas. Go right through and sew each strand to the next strand. Full up sole until only ¼ inch welt is left. Sew end of plait flat on top of sole. This type of sole needs an inner sole. Materials for outer covers: silk, satin, lace, woolen materials, cretonne, tapestry, old felt hats, curtaining, yarn wool, rug wool, fur, fur fabric, velvet, velveteen, leather, old carpet. For linings: old underwear, silk, velvet, velveteen, fur, fur cloth and coat interlinings. Interlinings: should be of strong, stiffish materials such as canvas, old deck-chair canvas, old fine-straw hats, stout cotton. It is very important to get some kind of stiffening in the heels; otherwise they soon get trodden down. To stitch uppers to sole, use two needles and strong waxed thread. Insert needles into same hole, one up and one down. Pull stitches tightly and try to make them even. 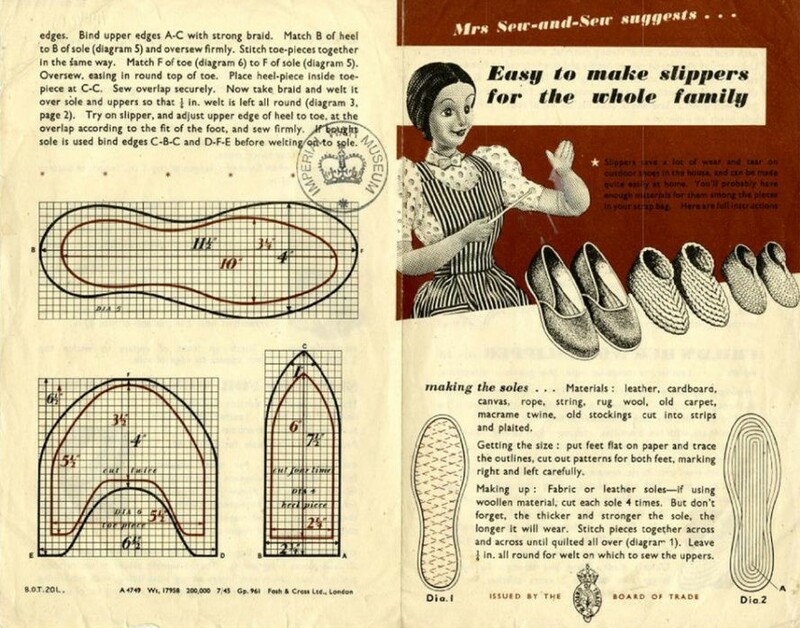 At the height of clothes rationing during World War II, U.K. civilians were introduced to Mrs. Sew-and-Sew, a fictional character cooked up by the British Board of Trade to promote the art of "make do and mend" in a non-confrontational but no less creepy way. Through a series of instructional leaflets, the glassy-eyed homemaker doled out advice on how to stretch out meagre supplies of cloth and other raw materials that were increasingly routed for military production. One of them was saving wear and tear on outdoor shoes by swapping them for slippers inside the house. "You'll probably have enough materials for them among the pieces in your scrap bag," she chirps, suggesting old carpet, rug wool, and even braided stockings as soles. Want to make your own? A facsimile of the flier, plus instructions, after the jump.